Moxie. She takes me anywhere I need to go. And, best of all, she brings me coffee. So she's a bit shaky, but I won't cry over spilt coffee ... well ... unless it all spills, then there might be some misting. So how do you get to work? Are you close enough that you could walk, bike or hop to work? 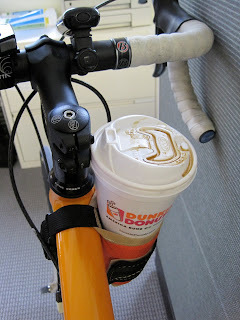 I can burn a few hundred calories, beat traffic AND still get my morning cup of coffee. Wouldn't you rather a calorie-burning commute? This entry was posted by kate, on Thursday, April 15, 2010. You can leave your response .